I don’t know about you, but I adore upholstered headboards. The soft, cushy backdrop looks luxurious and keeps me ultra comfy while I sleep. Readers will find beds with upholstery more comfortable than wood or metal options. Prop up a few pillows, and you’ll find yourself cozy as can be. Charles P. Rogers boasts a few lovely designs and depending on your taste and style, one of these gracious tufted beds could be giving you a good night’s sleep. 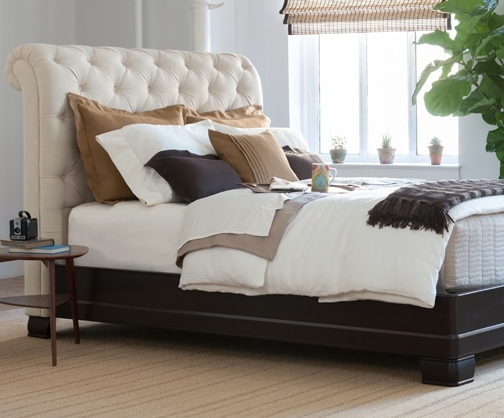 Get star quality with this higher-than-average tufted bed. You can’t help but feel slightly glamorous in white leather. If you prefer a more masculine aesthetic, opt for espresso hides instead. Either way, Tansy will transform any bedroom. Available in three configurations: traditional bed, platform bed, or headboard only, the Hampton is hand tufted with buttons in high-quality linen for a classically modern look. 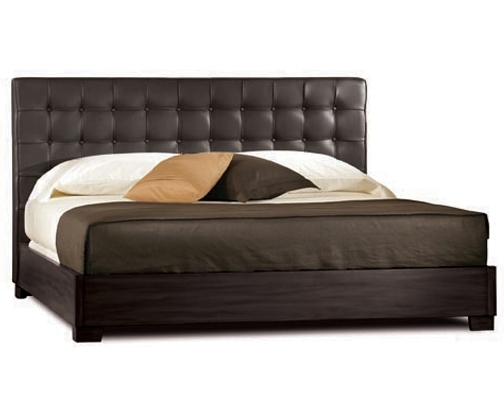 This bed is also available in plush grey velvet, sleek white leather, and chestnut vintage leather. Feel stately while sleeping in this crisp-looking bed covered in a soft micro-suede. The Pavilion includes inner upholstery, which adds durability, as well as a more luxurious feel. 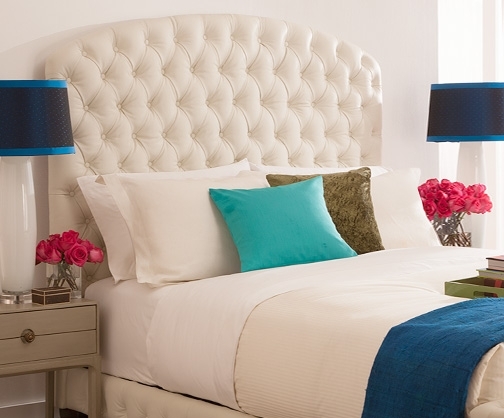 This headboard comes with fully upholstered rails and an upholstered platform. Upholstered in extra sturdy pebble-grained black leather, the Newhouse has a Bauhaus sensibility but has been brought into the 21st century. With its tufted buttons, classic proportions, and solid mahogany rails and feet, this bed is bound to make a design statement in any bedroom. For more info on upholstered beds from Charles P. Rogers, visit the website. 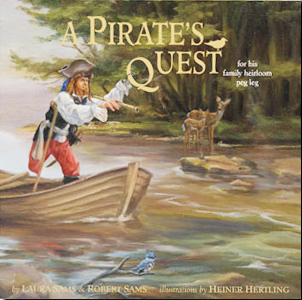 A Pirate’s Quest: For His Family Heirloom Peg Leg by Laura Sams and Robert Sams. Illustrated by Heiner Hertling. We don’t read too many picture books anymore. They’re still fun to read but all the ones we have at home have been read to tatters and the boy, now a fully independent reader, gravitates to the comics and graphic novels section now. This book was given to us as a Christmas present. It’s a somewhat silly story (though you wouldn’t guess it from the very artistic illustrations) about a pirate who lost his peg leg, an heirloom handed down from one-legged generation to the next. The pirate hopes to pass it down to a one-legged son or daughter one day. So when he awakes in his boat and finds it missing, he follows the lake to the river, river to the sea, searching for his precious heirloom peg leg. It’s a fun book to read, though sometimes it rhymes and sometimes it doesn’t, and when it doesn’t, it feels like it should. But the pictures are fun, and there are a bunch of animals hidden that you are supposed to find. (Actually they’re not hidden, you just have to see them.) An entertaining read for 3-6 year-olds. Plus, there is a song you can download from the authors’ website for free! The big Game Day fast approaches. Time to think about Super Bowl breakfast or brunch. This year I chose to go with the Seahawks to honor the lovely and bountiful Evergreen State. Washington is the source for many fine food products, including many varieties of fruit, grain, and seafood. But the local wild salmon ranks among the best in the world. Add a little smoke to the fish, and you’ve got the perfect partner for a traditional savory Breton crêpe. 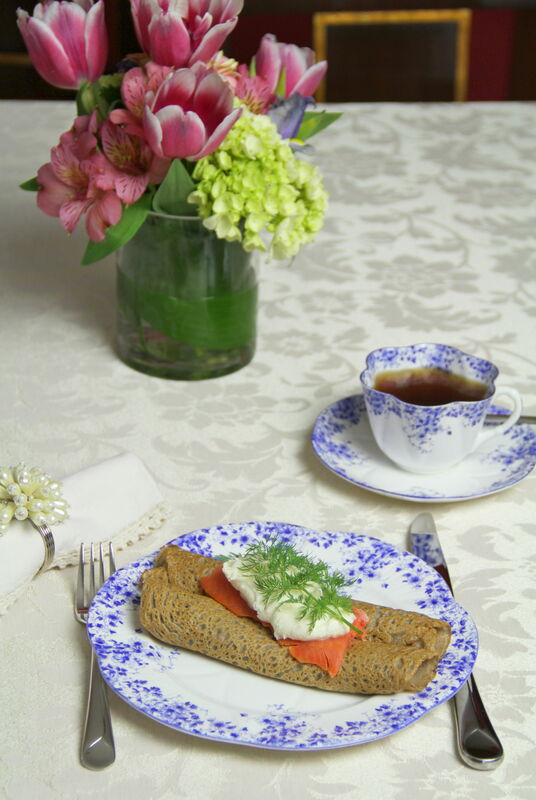 Earthy, buckwheat flour complements the lush, buttery salmon. Creamy crème fraîche adds a luxurious note, and fresh, green dill brings color and balance. 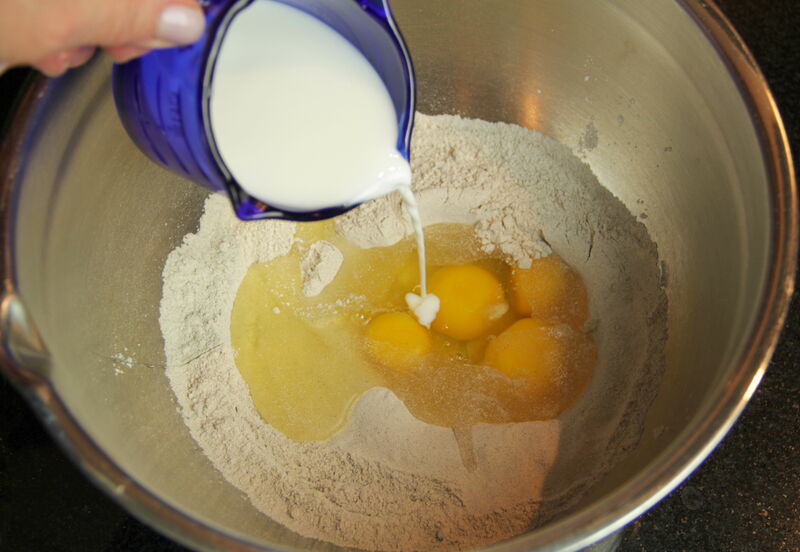 If you are not accustomed to working with buckwheat (which is no relation to wheat and a great gluten-free option), it may take you awhile to get used to the consistency of the batter. Thick and grainy when first mixed, it tends to separate as it sits. Be sure to stir the batter often as you cook up a batch of crêpes. Even if you’re not expecting a big crowd, go ahead and cook the whole batch. Then, lay each crêpe on a piece of parchment paper, stack them up and slip them into a plastic bag, then freeze them for future use. Whether you’re rooting for New England or Seattle, I hope you start the day with this lovely, bountiful breakfast in bed. 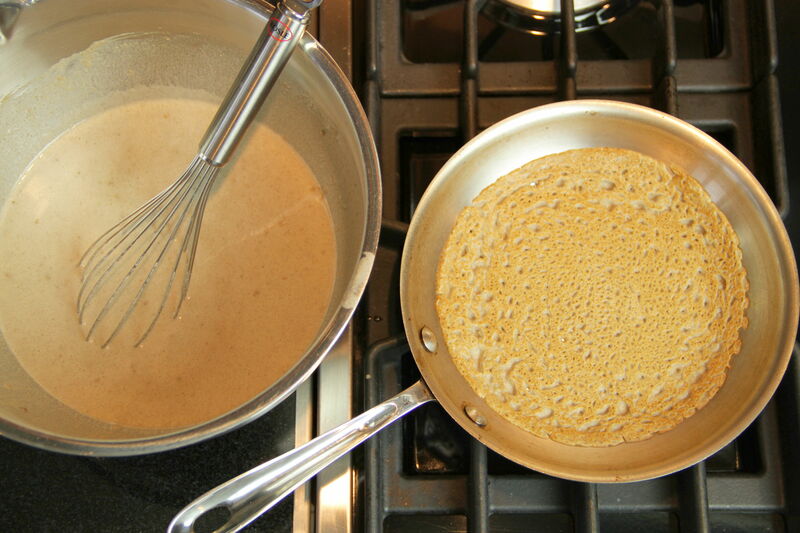 To serve, delicately roll crêpe into a long cylinder. 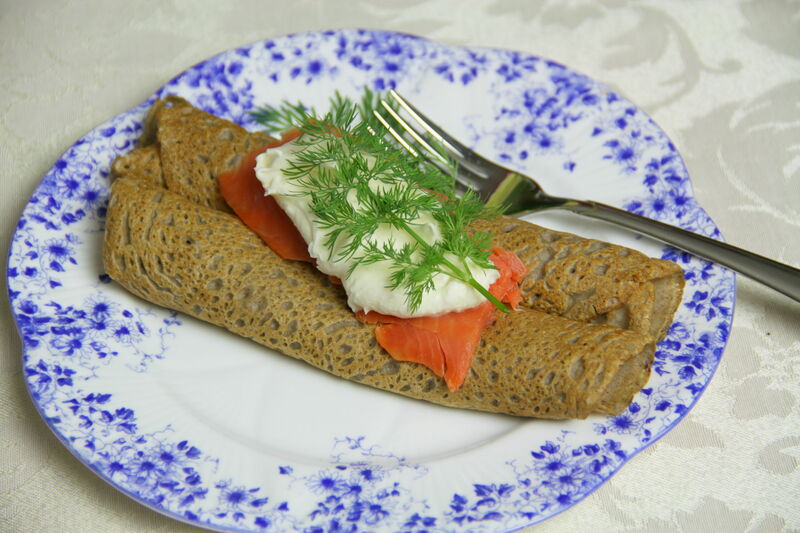 Place about ¼ of an ounce of smoked salmon on the rolled crêpe, then top with a teaspoon of crème fraîche and a sprig of dill. Repeat with remaining crêpes. We have a great deal of cooking competitions here in the United States, full of weird editing to make the judges look super mad and the contestants look super dopey. Lots of drama; the more, the better. Catty female cooks and cocky male ones. Most of those shows are just too much for me. I like “Chopped” and the ones where they make awesome giant jack-o’-lanterns. But you know what I like even better? “The Great British Bake-Off”. The title pretty much says it all. It’s British! 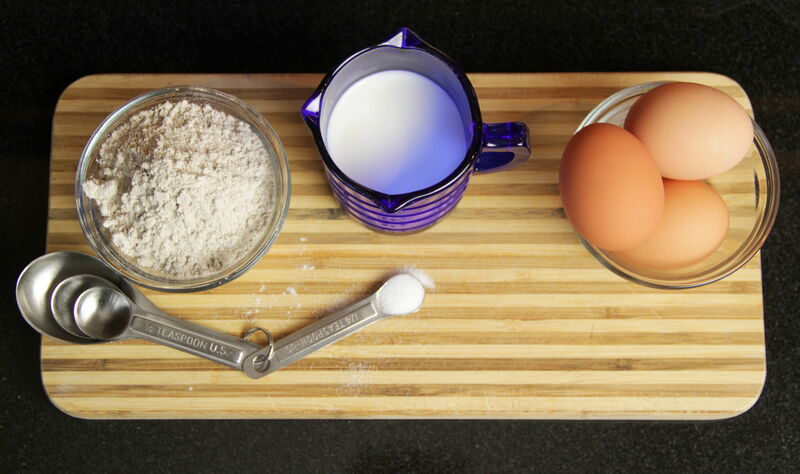 It’s all about baking! Twelve amateur bakers face off in three daily challenges: first round is the signature challenge, in which the contestants bake a tried and true recipe they make regularly. Next is the technical challenge, wherein they are given a recipe with only general directions and must rely on savvy and know-how to succeed. Third is the show-stopper. Given a general theme, they are to make something that not only tastes great but looks amazing. The contestants are a wide range, from an older Scottish Navy man to an adorable girl of seventeen named Martha, who always has a smile on her face. It’s fascinating from a cultural perspective as well, with Bakewell tarts and savoury biscuits and all manner of supremely British concoctions. 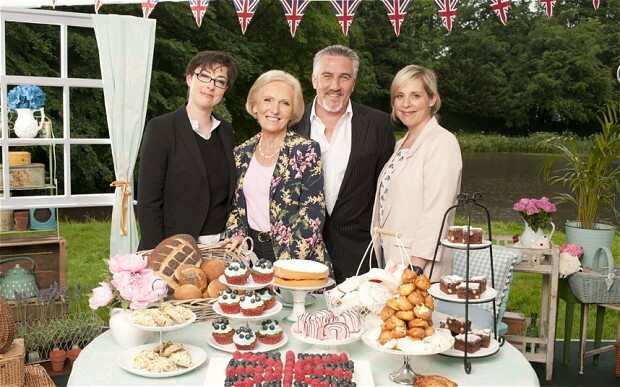 The hosts are charming and funny and the two judges, who are top-tier bakers in their own rights (Mary Berry and Paul Hollywood) are honest but kind. PBS is currently airing season five and it’s quickly become my favorite show to watch to unwind at the end of the evening. If you love baking, or competition, or are and Anglophile, definitely give this show a watch. Do you have a dream bedroom? Perhaps you fantasize about sleeping in a canopy bed with rays of natural light streaming in through tall casement windows. Or maybe you prefer a dark, masculine space with rich red wall covering, deep mahogany floors and formal damask drapery. You probably have a distinct vision in mind when it comes to your ideal room. Sweet or sassy, quaint or ordinary, bold or soothing, no matter your personal taste, if you’re a design aficionado like me, you more than likely appreciate even the most unconventional rooms. Talk about a view! This oversized Los Angeles bedroom extends out to the deck, which overlooks the ocean. The room has no ornamentation and doesn’t need it. The exterior becomes part of the interior. There’s nothing mundane about this bedroom in New South Wales, Australia. 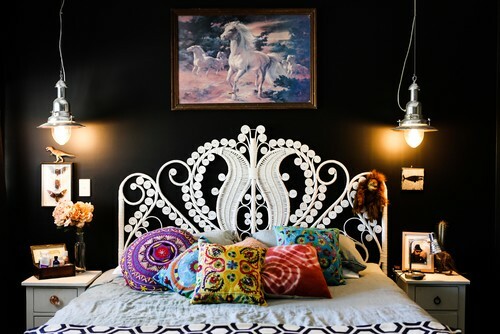 From the dark paint on the walls to the whimsical wicker headboard, pendant lights, and the unusual accessories, the space strays about as far as from conventional as you can get. What is it? A micro-bedroom? A mini-loft? 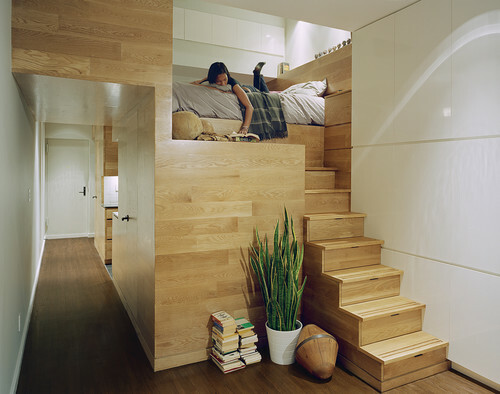 It’s a space-saving bedroom in Manhattan’s East Village that’s pretty darn clever, if you ask me. The room may be compact, but sure looks cozy. “Zen minimalist” is what the designer calls this space, and with its exposure to the great outdoors and Asian influence, I can see why. Designer Vivian Dwyer wanted to “insert modern elements into this house of the earth.” The bedroom has an adjacent open bathing area and faces giant redwood trees at the rear of the property.